Yesterday Islands of Adventure sold its five-millionth cup of Butterbeer – the delicous themed beverage sold within The Wizarding World of Harry Potter. 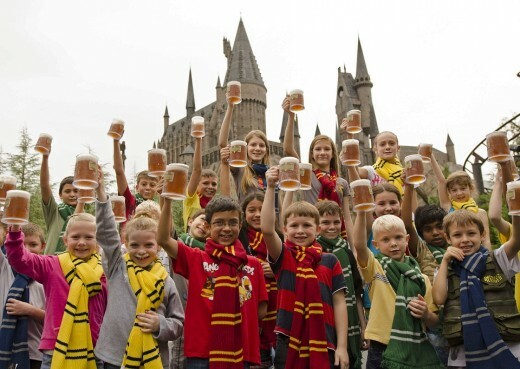 One thousand guests were given complimentary Butterbeers to mark the moment, with many of them sporting “Butterbeer mustaches.” The continued popularity of anything Harry Potter is good news for the Universal Orlando which is unofficially working on adding more wizardry to the resort. Since first being served to guests in The Wizarding World of Harry Potter in June 2010, Butterbeer has become one of the most anticipated and popular guest experiences at Universal Orlando Resort. Since the grand opening, Universal has added a fourth Butterbeer serving location within The Wizarding World of Harry Potter to accommodate the high demand by guests. Butterbeer appears as a favorite drink in the Harry Potter books and films, and Universal’s creative and culinary teams set out to create the beverage as yet another authentic experience within The Wizarding World of Harry Potter. The recipe for the non-alcoholic drink is a closely held secret – but the taste is reminiscent of shortbread and butterscotch and the beverage is served cold or frozen.